Ofcom’s report, Diversity and equal opportunities in television, uncovers the scale and nature of the diversity challenge facing the TV industry, with a focus on the main five broadcasters – the BBC, Channel 4, ITV, Sky and Viacom (owner of Channel 5). Broadcasters need to widen the range of talent working on and off screen. Too many people from minority groups struggle to get into television, creating a cultural disconnect between the people who make programmes and the millions who watch them. Ofcom research (PDF, 268.9 KB) has found that many people do not feel broadcasters are making programmes that authentically portray their lives and communities. The report finds that many broadcasters urgently need to undertake better, more regular monitoring of the make-up of their employees. Though most provided Ofcom with information on employees’ gender, the television industry could offer ethnicity data for only 81% of its workers, and disability figures for just 69%. Broadcasters provided even less information for other characteristics: they provided no data on the age of 43% of employees, provided no information on the sexual orientation of 62% of employees, and no data on religion or belief for 67% of employees. Women are under-represented. Women account for 48% of employees across the five main broadcasters, versus 51% of the wider UK population. Channel 4 has the highest number of female employees at 59%, followed by ITV (52%), Viacom (51%), the BBC (47%) and Sky (42%). Older men are generally more likely to be employed than older women. For example, 30% of men employed by the BBC are over the age of 50, compared to 22% of women – a difference of eight percentage points. The gap between the proportion of male and female employees aged 50 and over is much smaller at Channel 4 – 13% compared to 9%, a difference of four percentage points. Women are even less well represented at senior levels. All of the main five broadcasters have more men in senior roles than women. Viacom has the highest proportion of women at senior management level (48%), followed by ITV at 42% and the BBC at 39%. Women occupy 36% of senior roles at Channel 4, while Sky has the lowest proportion of senior female employees at 31%. Ethnic minority employees are under-represented. Ethnic minority employees make up 12% of employees across the five main broadcasters, lower than the UK population average of 14%. Two of the five main broadcasters employ a higher proportion of people from an ethnic minority background than the UK average: Channel 4 at 18%, and Viacom at 16%. The BBC ranks joint-third with Sky, at 13%, while the lowest proportion of people from an ethnic minority background is found at ITV, at 8%. Ethnic-minority representation is even lower at senior levels. Across the BBC only 6% of senior roles are made up of people from an ethnic minority background, with only ITV having a lower proportion. 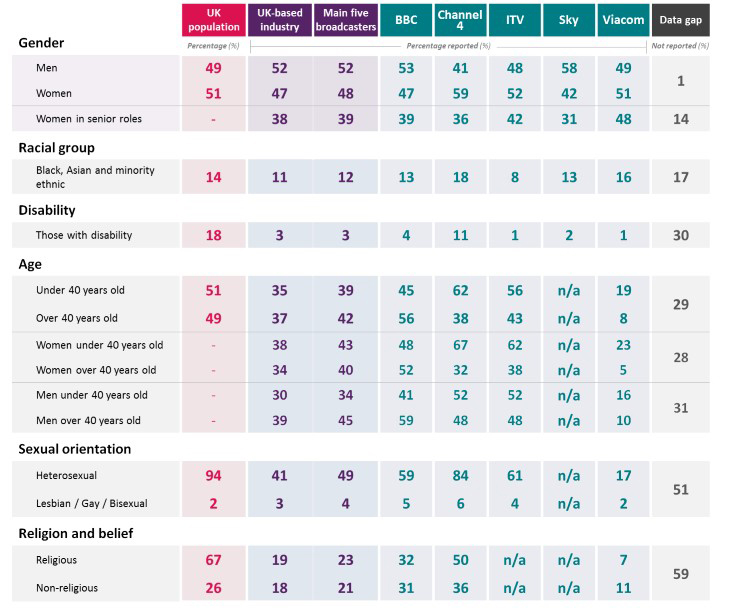 Sky has the highest proportion of senior employees from an ethnic minority background (up to 15%), followed by Viacom and Channel 4 (up to 10%). Disabled people appear to be significantly under-represented. Just 3% of employees across the five main broadcasters self-report as disabled, compared to 18% of the UK population. Channel 4 has the highest proportion of disabled employees at 11%, and Viacom the lowest at 1%. Four per cent of the BBC’s employees are disabled. Sky provided disability information on only 2% of its employees, and ITV on fewer than half. Sharon White, Ofcom Chief Executive, said: “Television is central to the UK’s cultural landscape, society and creative economy, and we believe that creativity in broadcasting thrives on diversity of thinking. While some broadcasters are already taking action (PDF, 514.9 KB) to improve diversity, a step-change across industry is required, with action needed by broadcasters. First, broadcasters should regularly measure and monitor the make-up of their workforce to a consistently high standard, capturing every relevant protected characteristic under the Equality Act, and all main job levels and functions. Second, Ofcom expects broadcasters to set clear diversity targets so their employees more accurately reflect the society we live in. Third, diversity transformation should be led from the top. We want chief executives to be accountable for delivery against their diversity targets. Comprehensive diversity policies need to be embedded from the top down, with senior diversity champions leading the agenda; appraisals of senior employees against diversity objectives; and ‘unconscious bias’ and diversity training. As the UK’s largest broadcaster, the BBC’s position on diversity is likely to have a disproportionate effect on the wider industry. The BBC should be leading the way, but today’s report shows its performance on most charactersitics is behind that of Channel 4. By 2020, the BBC wants its employees to comprise 50% women, 8% disabled people, 8% lesbian, gay, bisexual or transgender people and 15% people from Black, Asian and ethnic minority backgrounds. Ofcom is considering these commitments as part of our work on the BBC performance framework. We’re currently reviewing all the responses to our draft operating licence for the BBC, and will finalise the licence in the autumn. Ofcom has today announced a range of measures to supplement industry action on diversity. Further develop our monitoring programme. Today’s report is the first in a series of annual publications measuring the diversity of the TV industry, identifying which broadcasters are improving and which have more to do. We will work with broadcasters to help them to improve the quality and comparability of their data, and explore what new information can be provided to assess the social class of people in broadcasting, looking at their geographic and educational backgrounds. Holding broadcasters to account on equal opportunities obligations. We have examined in detail the arrangements each broadcast licensee has in place to promote equal employment opportunities, in line with their licence condition. Licensees we feel have inadequate arrangements in place will be asked to explain how they intend to meet their obligations. Better diversity guidance. In light of today’s report, we will update our diversity guidance for broadcasters. Broadcasters must have regard to this when when developing their arrangements to promote equal opportunities. Enforcement action against broadcasters who failed to provide requireddata. 57 licensees failed to respond to our request for information before the deadline, and we have begun enforcement action. Seeking additional powers. We have written to the Secretary of State for Digital, Culture, Media and Sport to request an extension to the list of protected characteristics in sections 27 and 337 of the Communication Act 2003. This would allow us to require broadcasters to provide data on a broader range of characteristics, rather than sections being voluntary, and require their equal opportunities arrangements to cover these characteristics. Publishing diversity data on the radio industry. Over the coming months, we will start work on measuring the diversity of the UK radio industry. Ofcom’s Diversity and equal opportunities in television report is based on anonymised data for nearly 50,000 staff working at 347 UK broadcasters. This is separate to Diamond, an industry-wide monitoring system which aims to capture diversity data on people working on or off-screen on all UK-originated productions. See more information on Diamond. Across the UK television industry as a whole, women account for 48% of employees, versus 51% of the wider population. Male employees comprise 63% of Board and non-executive employees, and 59% of senior management across the UK-based industry as a whole. The proportion of employees from a minority background across the UK television industry as a whole is 11%, versus 14% of the population. Ethnic-minority representation is similar within programming roles (11%) and commissioning jobs (13%). Across the UK television industry as a whole, people from an ethnic minority background only make up 9% of Board and non-executive level positions, and 8% of senior-management. Ofcom is considering these commitments in the context of the BBC’s public purpose under the Charter, to reflect, represent and serve the diverse communities of the UK’s nations and regions. Licensees which employ more than 20 people in connection with the provision of their service and are authorised to broadcast for more than 31 days a year are required to make such arrangements. In the case of the BBC, the Secretary of State would give a direction requiring the BBC’s arrangements to cover additional characteristics.